The National Opinion Research Center at the University of Chicago has been awarded a contract in support of the National Center for Immunizations and Respiratory Diseases (NCIRD) Influenza Division of the Centers for Disease Control and Prevention (CDC). The contract is to oversee the National Immunization Survey (NIS) and related tasks, and is valued up to $163,658,456 for one base and four option years. The objective of the NIS is to produce annual estimates of the proportion of noninstitutionalized children 19 through 35 months and 13 through 17 years receiving vaccinations recommended by the Advisory Committee for Immunization Practices (ACIP), in each of 56 nonoverlapping, geographically defined Local Sampling Areas (LSAs). It is also intended to describe sociodemographic disparities in vaccination coverage, factors that influence the vaccination status of children, the uptake of newly recommended vaccines, and how information about immunization is understood by the public. Vaccination for childhood diseases has proven to be one of the most effective public health measures available. This has been shown through the reduction in the incidence of vaccine preventable diseases throughout the United States. The adoption of laws for vaccinations as a requirement for school entry has been credited with high vaccination levels in this population. The 1989-1990 measles outbreak in the United States brought into focus the public health problem of under-vaccination among preschool children. Healthy People 2020 objectives for immunization and infectious diseases include reaching high proportions of children receiving recommended vaccinations by their second birthday and adolescents receiving additional recommended vaccinations by 13-15 years of age. In 1992, the 50 States and 28 local areas were awarded grants to improve the vaccination levels of children by their second birthday, and improve related service delivery, information and education, and assessment activities. Each grantee area developed an Immunization Action Plan (IAP) for the use of these funds and proposed approaches to improve the immunization delivery system in their areas (referred to as IAP areas). Determination of vaccination levels and changes over time was necessary for monitoring the success of the grants to these IAP areas. The NIS was established in response to the immediate and continuing need for quality and timely data pertaining to the vaccination coverage of pre-school children across the United States. Beginning in 1994, in addition to national vaccination coverage data collected via the National Health Interview Survey (NHIS), the NCHS and the National Immunization Program (NIP), which is now NCIRD, began collecting vaccination information for children 19-35 months in these 78, non-overlapping geographic IAP areas across the United States via the NIS, based on a random-digit-dial (RDD) landline telephone sample of households with immunization provider record check verification. This information has been used to monitor the need for vaccinations among 19-35 month old children in each IAP area and nationally in the civilian noninstitutionalized population. During 2005 and 2006, some of the non-grantee IAP areas were rotated off the survey (no longer oversampled) to allow new selected sub-state areas to be oversampled. Starting with 2007 data collection, the 22 IAP areas that did not receive direct Section 317 immunization grant funding from CDC were no longer automatically oversampled. Starting in 2007, state immunization programs were offered the opportunity to direct grant funds to oversample sub-state areas of their choice. This change resulted in core NIS data collection in 56 non-overlapping, geographically defined Local Sampling Areas (LSAs), including the 50 states and six urban areas that receive Section 317 immunization grant funding directly from CDC (District of Columbia; City of Chicago, IL; City of New York, NY; Philadelphia County, PA; Bexar County, TX; and City of Houston, TX). Additional sub-state areas and U.S.-affiliated jurisdictions may be added and may vary from year to year. 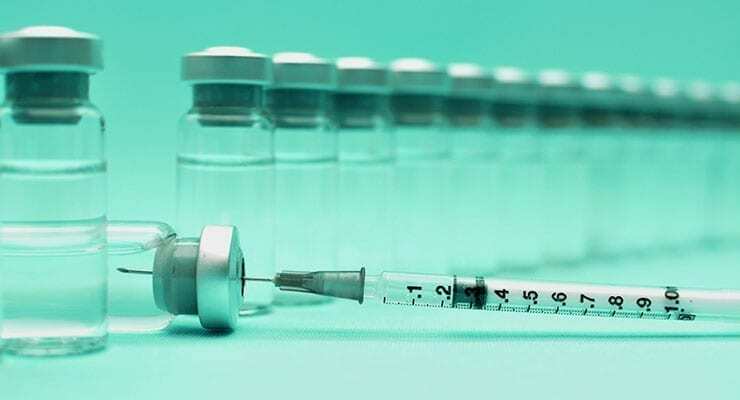 By 2006, three new vaccines had been licensed and recommended for routine use in adolescents: meningococcal conjugate vaccine (MCV4), tetanus, diphtheria, acelluar pertussis (Tdap), and (for girls) quadrivalent human papillomavirus vaccine (HPV4). In the 4th quarters of 2006 and 2007, the NIS-Teen was conducted using the NIS sampling frame and methods to estimate vaccination coverage among adolescents aged 13-17 years. In 2008, the NIS-Teen sample was expanded to provide estimates for the 56 core NIS LSA’s, and starting in 2009 additional sub-state areas were added at the request of some states. It is possible that CDC may need to change the age range of children included in the NIS in the future. The NIS has periodically added topical modules to the household interview to collect additional vaccine-related information as needed by CDC. A health insurance module to determine status of eligibility for the Vaccines for Children Program (VFC) was added in 2003 and became part of the core NIS survey in 2006. Recent modules have included expanded questions related to socioeconomic status and parental hesitancy to vaccinate their children. Surveys of adult vaccination were conducted in 2003, 2004 and 2007. During October 2009-June 2010, questions were asked of children of all ages identified during NIS screening to monitor seasonal and monovalent 2009 (H1N1) influenza vaccinations. These data were combined with a stand-alone dual frame landline and cell phone RDD influenza vaccination survey to comprise the National 2009 H1N1 Flu Survey (NHFS). For subsequent influenza seasons, this data collection, called NIS-Flu, has continued each October through June for children aged 6 months through 17 years. Collectively, the data collected from the same sample frame consisting of children 19-35 months (NIS core), 13-17 years (NIS-Teen), and 6 months – 17 years (NIS-Flu) is described as the NIS Family of Surveys. Research to improve the validity of survey estimates and effectiveness and efficiency of survey operations has been integral to the NIS since its inception. In recent years, declining willingness of the public to participate in surveys and changes in households’ use of the telephone has resulted in declining response rates in the NIS and other surveys. Of particular concern is the increasing prevalence of households that have substituted their landline telephone for wireless service only. Over 40% of children aged 19-35 months may not be reachable by a landline survey. Addition of a cellular telephone sampling frame was piloted in 2010 and incorporated into the NIS starting in 2011. Other research has investigated the potential role of Immunization Information Systems (IIS) in the conduct of the NIS. IIS are confidential, population-based, computerized databases that record all immunization doses administered by participating providers to persons residing within a given geopolitical area. At the point of clinical care, an IIS can provide consolidated immunization histories for use by a vaccination provider in determining appropriate client vaccinations. At the population level, an IIS provides aggregate data on vaccinations for use in surveillance and program operations, and in guiding public health action with the goals of improving vaccination rates and reducing vaccine-preventable disease. IIS exist in most states, but vary in their level of child and provider participation, completeness of vaccination histories, and completeness and accuracy of household contact information. With continued development of IIS and increased use of electronic medical record systems and their integration into IIS, they may eventually replace the role of NIS in providing timely, valid and comparable estimates of vaccination coverage across state and local areas. In the shorter term, NIS and NIS-Teen samples have been matched to selected IIS to compare vaccination histories reported by both, and the potential use of IIS as a sampling frame, as a supplement to or in place of a telephone sample, has also been evaluated. Substantial efficiencies could be gained using IISs to supplement or replace the current NIS RDD telephone sampling frame. Further work is needed to define when an IIS is ready to be used as a sample frame, identify legal and policy barriers to data sharing, and assess willingness and resources needed by states to participate. The potential role of IIS to improve the efficiency of the NIS provider record check has also been evaluated.